Comparing the performances of West Virginia quarterback Will Grier can be difficult, given the regularity with which the Mountaineer senior clicks off 300+ yard passing shows and touchdown connections. With so many to choose from, it might be difficult to pick a “best” for the Heisman Trophy candidate, but WVU head coach Dana Holgorsen didn’t hesitate in selecting a winner. Grier was 25-39 for 343 yards and three touchdowns, with his only interception coming off a deflected pass. West Virginia used David Sills as its primary punt returner against the Horned Frogs, and the senior was excellent in the job Holgorsen views as the most important above all else: catching the ball. Holgorsen was in a jovial mood when considering what makes he and offensive line coach Joe Wickline work well together. West Virginia’s running game has gone through several iterations under Holgorsen, from single back to two and even three backs in the backfield to the current tight end\fullback\wingback sets. Oklahoma State week always brings back memories and questions about Holgorsen’s time in Stillwater, and he admits to enjoying it while also noting that the Cowboys’ current 5-5 record isn’t reflective of its talent. A common theme for Holgorsen is increase comfort level in “Year Two” of any system change, whether it be personnel at a position (especially quarterbacks) or coaches in new roles. West Virginia’s use of transfers in building its team is getting more notice nationally. Holgorsen joked that the topic, including WVU’s mining of the now-defunct Eastern Christian Academy for talent, might be a suitable topic for a 30-for-30 episode. Oklahoma State head coach Mike Gundy isn’t comparing statistics when he notes that West Virginia’s and Oklahoma’s defenses are similar as part of his contrast of the two teams. WVU has allowed 20.9 points and 354 yards per game this year, while the Sooner defense has yielded 29.8 and 416, respectively. 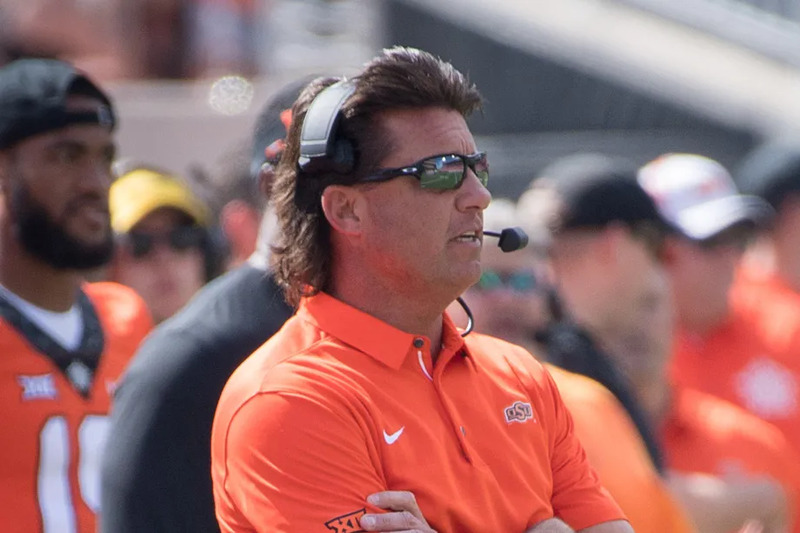 Gundy is in the midst of what some are calling a rebuilding year, although the Cowboys are 5-5 and stand just one win away from a bowl bid. It has been an up-and-down season with very good wins over Boise State and Texas, but close losses to Iowa State, Baylor and Oklahoma. The Cowboys are ninth in the league in penalty yardage, seeing 73 yards per contest of walk-offs. West Virginia, this week’s opponent, is eighth at 72.3. OSU dropped a 42-41 decision to the Sooners after missing an extra point and a 41-yard field goal. The former led the Cowboys to go for a two-point conversion following its final touchdown in the waning moments of the game, rather than being in position to kick another extra point to win it. Oklahoma State is now 2-of-7 on field goals over the past three contests. Iowa State head coach Matt Campbell is not concerned that his team will be without running back David Montgomery for the first half of the Texas game. Montgomery was ejected for throwing punches during a melee with Baylor last Saturday. Montgomery is second in the league in rushing, averaging 95.6 yards per game. Count Kansas State head coach Bill Snyder as one who sees getting to a bowl as a still-important goal. Texas Tech (5-5) boss Kliff Kingsbury agrees. Texas, a team built on defense in days of yore, has seen its greatest improvement on the offensive side of the ball since the start of this season, according to head coach Tom Herman. The Longhorns won a 41-34 shootout with Texas Tech on a touchdown pass with 21 seconds to go after dropping a similar 42-41 duel with West Virginia the week before. QUOTABLE: “I don’t know how you have an emotional letdown when you lose.” – Kansas head coach David Beaty, answering a question about avoiding a letdown following his team’s 21-17 loss to Kansas State.